Overwhelmed? Let us do the work for you. Swing Shackle w Bolt 5/16"
Quality Playground Equipment for Parks, Schools, and More! At Noah's Park and Playgrounds, we understand just how important having the right commercial playground equipment for your school, park, church, or daycare playground can be. In fact, helping our clients locate the right play structures and accessories is all we do! 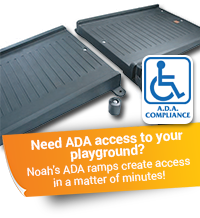 We provide a vast selection of items for early childhood playgrounds, ADA accessible playgrounds, and other recreational playgrounds at reasonable prices. We can help whether you are an HOA, childcare center, school district, park/recreation department, or any other type of group. We also understand that while providing an excellent setting for making childhood memories is important, the actual durability and safety of the overall product is extremely vital and only offer the highest-quality and safest pieces on the market. Are you looking for a specific commercial playground equipment piece? Whether you are searching for single swing seats or plans for an entire play area, please contact our friendly and knowledgeable team via email or by calling 1-877-248-5444.